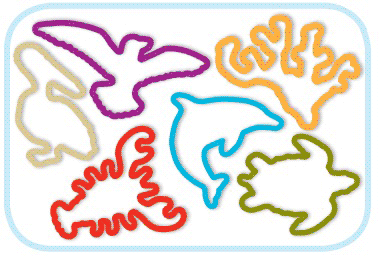 Buy Silly bandz for a good cause. According to Deepwater Horizon Unified Command, 5,792 birds, 561 sea turtles, and dozens of other wildlife have died so far due the Deepwater Horizon oil disaster. At least 50+ million gallons of oil along with an unrecorded amount of dispersant, is still lingering in the Gulf coast’s waters, putting both people and wildlife at risk. So, what can you and your kiddies do to help? BCP Imports LLC, the Ohio-based company that created Silly Bandz, has announced the release of its Save the Gulf Silly Bandz (www.savethegulfbandz.com), a version of its popular kids’ and adults’ product, to help raise money for wildlife and communities affected by the Gulf oil spill disaster. A portion of sales from every pack, sold online and in major retail stores, will go to both the National Wildlife Federation and the Greater New Orleans Foundation directly t helping rescue the wildlife, rehabilitate our communities, and prevent further damage to our shore lines and animal nesting grounds. What a great opportunity to teach children about caring for wildlife!